About 4,000 wild horses live on Devil's Garden Plateau, a protected territory inside Modoc National Forest near the Oregon border. It's home to the largest herd of wild horses in the country managed by the U.S. Forest Service. "With a population growth rate of 20-25 percent, 800-1,000 wild horses will be born on the Devil's Garden this year, making these small removals negligible," said Laura Snell, UC Cooperative Extension advisor in Modoc County. Snell's research on wild horses at Devil's Garden was chronicled in California Agriculture journal by executive editor Jim Downing. The federal government has determined the ideal horse population on the 230,000 acres of wild horse territory is no more than 402, however, more than 4,000 wild horses are running on the land. The current federal horse gathering was prescribed by the 2013 Devil's Garden Plateau Wild Horse Territory Management Plan to help address impacts on aquatic resources, wildlife, grazing and traditional cultural practices. Reducing the population will allow range and riparian ecological conditions to recover, while also supporting wild horse herd health by reducing competition for limited food, water and habitat, according to a Modoc National Forest press release. Most gathered horses are expected to be under 10 years old and will be available for adoption at the BLM Litchfield Corrals. 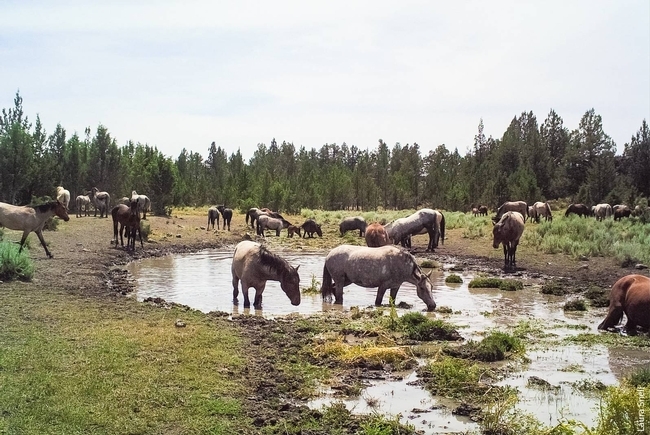 Gathered horses 10 and older will be cared for at the new Double Devil Wild Horse Corrals on the Modoc National Forest and offered for adoption and sale. To adopt a young horse, see https://www.blm.gov/adoptahorse/ or wildhorse@blm.gov. To adopt or purchase an older horse go to https://go.usa.gov/xQ3r3.